The restrictive immigration policies that are currently in place in the United States nowadays are contrary to the spirit and principles upon which this country was founded, and they must be eliminated in favor of a system of open immigration for the sake of the country’s ideological integrity as well as its financial integrity. The very principle of the issue demands it. Anti-immigration rhetoric in this country has seen a surge thanks to the efforts of groups such as FAIR (Federation for American Immigration Reform), founded by John Tanton, a white supremacist whose major funding comes from the Pioneer Group- another white supremacist organization whose main platform is the support of eugenics. While groups such as FAIR would gladly paint an image of a racially homogenous America, their very arguments crumble into dust upon examining any family tree. Regardless of current status, every man, woman and child alive in the United States has an ancestor in their family tree who, at one point in history, set foot on these shores a complete stranger to its ways, its people, and its language. What awaited this traveler at the turn of the 20th century was not a draconian process requiring thousands of dollars and Monte Carlo odds, but a rather simple medical checkup and other cursory examinations. It is a simple fact that if today’s immigration regulations were in place when the honorable ancestors of these men and women came to America, they would have been rejected and sent back… or, perhaps not wishing to go back to a country in the dawn of war, they might have jumped the border and become illegal immigrants. Illegal immigrants become thus because, through sheer over-regulation, the government has turned the entire process of immigration into a nearly-impossible goal. Individuals not unlike the ancestors of our current prominent political figures (the O’Reillys – Irish peasants, or the Tancredos—Italian peasants) must either face the choice of staying in countries that are in strife (Mexico, Venezuela, Ecuador, Honduras), or seek to carve a new life in a freer country—even it if means risking the status of illegality. Decades ago, America welcomed such immigrants; today they must claim the promise of American freedom through the barbed wire and the border fences. One of the common fallacies used against open immigration is that an increased number of immigrants will ‘dry up’ the job market and send the economy plummeting. This is known as the “Zero Sum Fallacy”, because it assumes that wealth and industry are a zero-sum game: that there are only so many ‘slices of the pie’ available at one point or another, and that it therefore runs out with more people 'grabbing' for then. If this argument were actually true, then the great cosmopolitan cities such as Los Angeles and New York, who have some of the highest population density in the country, would necessarily have to be wastelands of abject and complete poverty all across the board, and the arid and desolate expanses of Kansas’ small towns being shining examples of wealth and prosperity. The fact that reality is quite the opposite points towards something that the country has known from its very inception: increased population causes an increase in the demand for skills, goods and services, and the new immigrants help ensure that those demands are covered—generating wealth and prosperity. Opponents of immigration also forget the most glaring error in their argument: That the O’Reillys, the Coulters, the Tancredos and other prominent figures are the direct beneficiaries of lax immigration laws in the past. Very few- if any- of their ancestors possessed degrees, many may not have known how to read at all. Under the immigration laws currently in place (and under their proposed, stricter laws) they would have all been turned away. Yet these ancestors were able to stay, work and prosper in America, and the most recent generations of their family trees reap the fortunate rewards whilst arguing that no-one else should have the same opportunities that their ancestors enjoyed, and from which they are currently benefitting. Their argument even goes further towards barring any rights for anyone except American-born citizens. The very spirit of independence that created America revolts against such a notion- the ideas of monarchy and privilege by blood, where a group of people were given more rights than others because of who their fathers were, were the ideas that generated oppression against the colonies: a small sub-set of the population felt entitled to the property, income and land of others merely because of birthright. It was Thomas Payne, in his essay on Common Sense, who said “For all men being originally equals, no one by birth could have a right to set up his own family in perpetual preference to all others forever.” The idea that citizenship and the recognition of rights should only be applied to those born on US soil is the violation of that; it is the establishment of privilege by heredity, of aristocracy. And even if a person could take leave of their senses long enough to consider that argument seriously, the question arises: how far back is it to be applied? 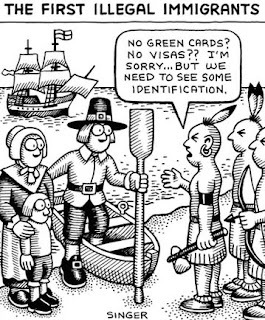 Go back far enough, and nobody (except the Native Americans) was born on U.S. soil. Stop at any point before that, and it is simply an aleatory non-objective law. As Russian immigrant Ayn Rand pointed out, “only a non-objective law can give a statist the chance he seeks: a chance to impose his arbitrary will—his policies, his decisions, his interpretations, his enforcement, his punishment or favor—on disarmed, defenseless victims.” This is precisely what opponents of immigration- both private individuals and government functionaries wish to achieve, they require non-objective law and prejudice to bolster their bravado, as they have no rational arguments to back their claims. No matter how they may wish to phrase their fallacies, the irrefutable truth is that the Constitution does not discriminate in its allocation of rights between citizens and non citizens, and it also does not deny the right of any man, be he a law-abiding citizen, to live where he wishes to live. Washington D.C’s baroque and overtaxed immigration machinery has made criminals out of the kind of people who, many generations ago , might have been found descending from a boat at Ellis Island or, even further back, from the Mayflower itself.